Clean the dust from your Electric Pressure Cooker and letâ€™s start cooking mouth-watering meals! Get invaluable experience of cooking delicious meals in your Instant Pot and start to cook tasty homemade stews and braises. The Ultimate Instant Pot Cookbook is an exclusive cookbook you ever seen. We used the most optimal recipes, the preparation of which will take you a little time. In addition, products that are used in our recipes can be easily found at the nearest store. 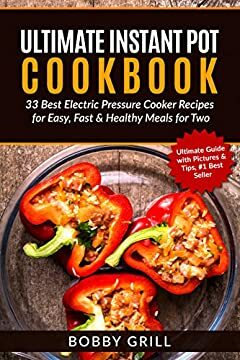 It doesnâ€™t matter you are looking for a beginnerâ€™s guide, look for new ideas for your family dinner or just in search of simple and healthy recipes, you will be inspired by Ultimate Instant Pot Cookbook! Choose your favorite recipe and start cooking in your Electric Pressure Cooker today! Surprise your family and friends with easy and amazing recipes.